Calcium is an essential mineral that can be found naturally in foods such as dairy products, added to foods such as soy milk, or as a dietary supplement as calcium carbonate or calcium citrate. Calcium carbonate is a mineral naturally derived from the earth's limestone, marble or sedimentation of crushed marine shells. Selecting foods fortified with calcium carbonate can help you reach your daily requirements for calcium. Calcium is an essential mineral that provides strength to bones and teeth, but it has several other health benefits. Calcium is essential to nerve conduction, hormone status and muscle contraction. Some research has shown that diets rich in calcium, fruits and vegetables can reduce the risk of high blood pressure. The Dietary Approaches to Stop Hypertension diet, the DASH diet, focuses on these foods. The DASH diet recommends 1,250 mg of calcium daily. Your calcium requirements will change throughout your life depending on your age and gender. Children and teens ages 9 to 18 years old need 1,300 mg daily, while all adults up to age 50 need 1,000 mg of calcium daily, either from food or supplements. Women's calcium needs increase to 1,200 mg daily over 50 years of age because postmenopausal women do not absorb calcium well. Age decreases the efficiency of calcium absorption, so all adults over age 70 are encouraged to get 1,200 mg of calcium daily. Calcium carbonate is added to many foods such as ready-to-eat breakfast cereals and cereal bars, milk alternatives such as soy or almond milk, and some baked goods. The Daily Value -- developed by the U.S. Food and Drug Administration for labeling purposes -- provides a set value for nutrients. The established DV for calcium is 1,000 milligrams, so a food with 25 percent of the DV for calcium would provide 250 milligrams per serving. A serving of Total Whole Grain cereal -- manufactured by General Mills -- provides 1,000 milligrams of calcium per serving. Kellogg's Nutri-Grain cereal bars meet 20 percent of the Daily Value for calcium. Two Kellogg's Eggo waffles contain 25 percent of the Daily Value. 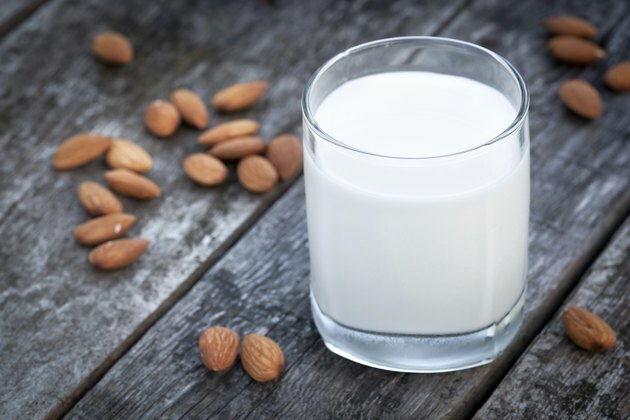 Silk brand's soy and almond milks each contain 45 percent of the Daily Value for calcium or 450 milligrams in a 1-cup serving. Not all cereals, waffles and non-dairy beverages contain added calcium. Compare the Nutrition Facts labels to determine which brands meet your needs. The most commonly available supplements are calcium carbonate and calcium citrate. Calcium carbonate is less expensive though it requires stomach acid to aid in proper absorption. Take it after meals or with an acidic food like orange juice. Calcium citrate does not require stomach acid for absorption and may be useful for people with absorption disorders like inflammatory bowel disease. Calcium is best absorbed in doses under 500 mg. If you need to supplement with over 1,000 mg daily, it is recommended you split the doses between morning and evening. Vitamin D enhances absorption of calcium -- look for this in your supplement as well. Check with your doctor before using any dietary supplements, including calcium. National Heart, Lung and Blood Institute: What is the DASH Eating Plan? Industrial Minerals Association-North America: What is Calcium Carbonate?